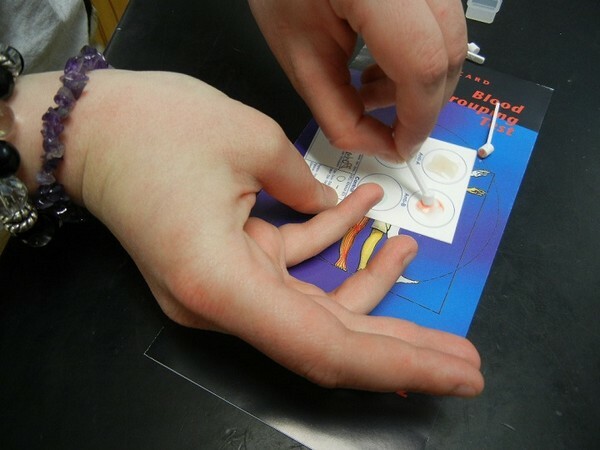 As part of anatomy, students test their own blood types using kits supplied by a biological supply company. 1. Activate the serum on the circles by adding a drop of water. 2. Sterilize finger with alcohol pad and use a lancet to prick finger. Massage finger to get a generous drop of blood. 3. Use a plastic eldon stick to transfer the blood to the serum and stir the blood. 4. Use a new stick for each test circle to prevent cross contamination. 5. Slowly tilting the card will prevent coagulation while the antibodies react to the serum on the card. 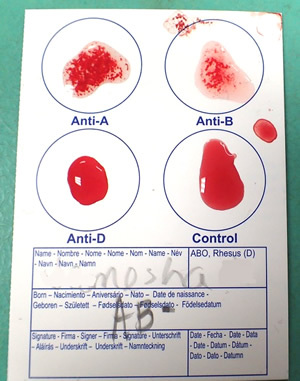 A positive test will show obvious signs of clumping. 6. Clean finger with alcohol pad and apply a bandage.